← I’m most like an Ethiopian apparently?! Heres a strength and fat burn workout for someone who wants to make the most of their workout time in the gym. Research has shown that high intensity interval training is good for burning fat and helps your body keep burning calories well after you’ve finished exercising. 1 hour session each time. (or 1:15 with additional circuit). Do 5 minute steady warm up on the treadmill, rower, cross trainer or bike. 1st 2 exercises of each section done with weights for reps shown. Then choose one of the 3rd plyometric exercises and do it for 30 seconds (use HIIT app timer on phone). Do as many reps as possible, get your heart rate up. During the circuit try to take as limited rest as possible. Lift weights which you use correct form with, where the last few reps become tough. If a weight becomes easy, increase the weight next time. After you get used to the exercises, do two sets of each body type section for a 25 minute strength session, or 3 sets of each for a 36 minute strength session. Option to choose two body parts to work, 3 sets of each for a 20 minute strength session. Work the other two body parts next workout. When you get on the bike, set it to your desired level, and set scroll to see rpm. >; Set bike to between level 5-10. >; Warm up for time detailed. >; HIIT work will be 40 seconds of every minute as detailed, then 20 seconds recovery. HIIT minutes : 40 secs 100% effort (rpm 100-120). Followed by 20 secs recovery (rpm 60-80). >; Do HIIT minutes for 4 minutes. >; Recover for 1 minute. >; Do HIIT minutes for 5 minutes. >; Do HIIT minutes for 8 minutes. >; Do HIIT minutes for 12 minutes. >; Do HIIT minutes for 15 minutes. >; Do HIIT minutes for 20 minutes. Cool down for 2 minutes. 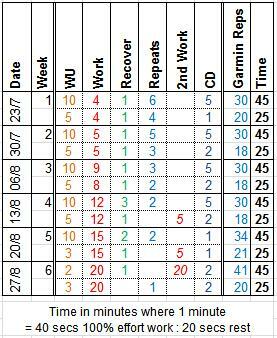 (Once you’ve built up to week 6, continue to do the Wk6 workout or increase the time of the workout). There’s also the option of doing one 45 minute HIIT cardio workout a week, in addition to your wirkouts, or instead of one strength and HIIT workout. This entry was posted in Bike Workout, Circuits, Intervals, Tabata, Weights. Bookmark the permalink.